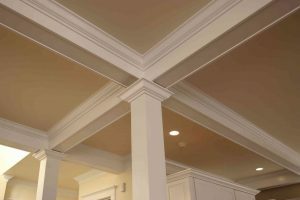 Have you considered adding crown molding to your Maryland home? A little work can go a long way when it comes to making home improvements inside of your house. You know this to be true with adding new stainless steel draw openers or changing the color of accent colors to a lighter feature. If you can’t afford to customize big appliances in your house, think about making smaller, yet prominent improvements that can be customized to your liking. One home improvement upgrade you should consider customizing is your trim work. We know that wasn’t your first idea, but here are some reasons why this can end with being the best money you’ve spent thus far. Customizing your trim works means creating a unique design that no one has in their house, thus separating it from others and adding more value. You can create unique designs on your ceilings or even on the doorway to your bedroom. The great option about customizing your trend is having the opportunity to create new looks for every room of the house. No two rooms will look alike and your guest will notice the hard work and one-of-a-kind detail spent in making your house fit your personality. Customizing anything in your house can mean spending more than you’ve bargained to and that is still the case for customizing your trim works. If you want a top-of-the-line look to your home, the end result will outway the cost. As we have mentioned some areas where custom trim works can be placed, there are multiple other areas around your house that this home improvement upgrade can be placed. When visiting a model house for custom trim inspiration, check out unnoticed spaces like around the windows or shelving in an office. The opportunities to create a custom trim works are endless and this is an area of home improvement that embodies the creative being that you are. One way to add an expensive look to your house through custom trim work is by applying crown molding. This is an upgrade that most want in their house and look for in others. Crown Modeling also has its benefits outside of adding a certain look to the inside of your house. It can make our ceiling look taller than it actually is and gives it depth and definition. Though it may look like it took months for the custom trim work to apply to the house, the longest process of getting this home improvement done is picking out the design. The actual application of the custom trim doesn’t take long at all and can actually save time on other improvements you wanted to do instead. At Matthews Construction, our experienced staff can help you plan the remodel of your dreams without breaking your budget or your patience. Whether you want an expertly constructed master bathroom or have another remodeling project in mind, Matthews Construction has the expertise and equipment to make your dreams a reality. We are committed to providing our valued customers will excellent service and top-notch quality. If you are interested in learning more about what we can do for your home, give us a call at (202) 702-3553 or visit us online. For more tips, follow us on Facebook, Twitter, Houzz, and Google+. This entry was posted on Friday, June 22nd, 2018	at 1:39 pm	. You can follow any responses to this entry through the RSS 2.0	feed. Both comments and pings are currently closed.